Whisk together all ingredients with 1/4 teaspoon each of salt and pepper. Bring lentils, vegetable stock , and 1/2 teaspoon salt to a boil, reduce heat and simmer, uncovered, until lentils are just tender, 20 to 25 minutes. Remove from heat and let rest for 5-7 minutes. Reserve a 1/2 cup of the cooking liquid, and then drain the lentils. 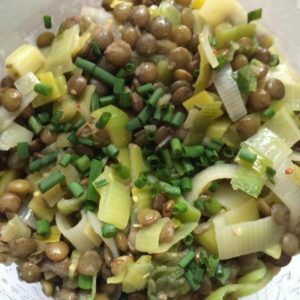 While the lentils are cooking, chop the leeks, place in a bowl and cover in water. Glide leeks back and forth until sand and sediment float to the bottom. Remove chopped leeks with a straining spoon. Sauté the leeks in olive oil, in a skillet over medium to low heat, stirring occasionally, until softened, 6 to 8 minutes. Add the lentils with the reserved cooking liquid to the leeks along with 3 tablespoons of the herbed mustard oil and cook, stirring, until the lentils are heated through. Add the lemon juice and salt and pepper to taste. Remove from heat and serve as a delicious side, or as a main course with some cooked quinoa. Garnish with additional chopped chives and tarragon.